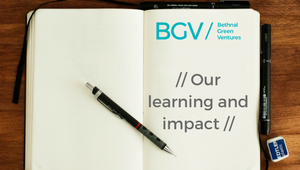 We’re very pleased to announce that Bethnal Green Ventures has been certified as a B Corp. If you haven’t come across the idea before, it’s a voluntary system for companies to show that they meet rigorous standards of social and environmental performance, accountability, and transparency. 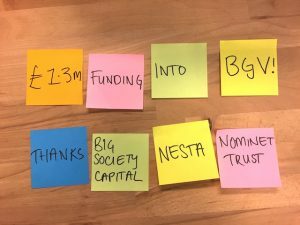 B Corps are required to change their legal documents so that employees, communities and the wider environment rank alongside shareholders in decision making processes. We’re joining companies like Etsy, Change.org, Kickstarter, Patagonia and our friends over at Fairphone as well as a whole host of companies who are newly certified in the UK. 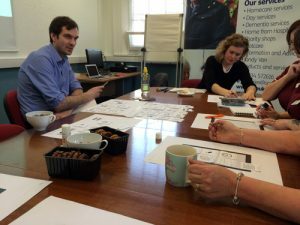 We first talked to the UK B Corp team about applying earlier this year and we’ve found the process of certification useful in its own right. At first it just looks like a long online form and I’d say the first draft took us about half a day to complete. There are a few questions on there that are still a bit US centric but almost every page makes you think. We’re still a relatively small and young organisation so it actually helped us to begin to put good systems in place to make sure we meet the standards we aspire to. Once you’ve completed the form you then have a Skype interview as the B Labs team go through any questions they have about your answers on the online form. They also ask you to upload documents so that they can see proof that the policies you say you have actually exist. For us becoming a B Corp is a statement that we’re about more than money. We’re doing our best to improve the social and environmental impact of our work and our organisation. To be honest we’re now a bit competitive about it. Our score is 92.5 which is well below our friends at Fairphone who certified back in May with 104 and we’re already scheming about how we’ll catch up! 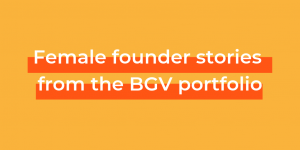 We also like that B Corps feels like a community rather than just a certification process and we’re looking forward to the UK launch event in Camden this evening. Congratulations to James, Charmian and the team who have brought B Corps over to the UK. We hope it’s a movement that grows!